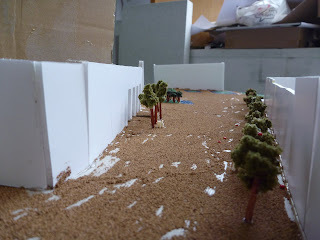 The final result of the project, dealing with public places. I tried to reconnect the city a bit, by leading the tracks in the Museum garden into the Park Square (formerly Park Road) and on into Nygårdsparken, covering them with sandstone and planting lots of fruit trees bearing red fruit, such as "Rød Gravenstein" apple, "Amanogwa" cherries and plums, wild plums and "Victoria". I also pushed the cars away and reused the street furniture from the "STRANGERS" post, placing five of them in between some of the trees. In the far end of the square, a "Vistoria" plum tree grove, by the swimming pool façade of the Student centre, with a pond and an artificial creek. Got lots of response this time, and alot of interesting suggestions to work with. The sand was not supposed to halve bold spots. Do not use RX glue and model sand when trying to make sandstone. The design actually turned out to be a bit more classical than planned, and one of the things I plan to work with, is to become more expressive. I'm not sure that very "expressive" architecture is what I'll be doing after BAS, but I believe in learning a system, and then perhaps choosing to do something else if one wants to. Other than that, staying away from the incredibly cold Hall, where our class is working with visual structure in 1:1 right now, because of a slight cold and big tonsils within a hurtful throat.